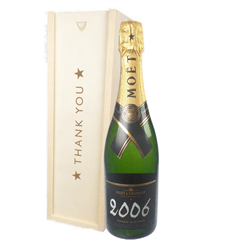 A single bottle of Moet & Chandon Vintage Champagne. The current vintage is 2012 and tastes superb. This is presented in a wooden gift box and is lined with wood wool. Personalize this gift by adding your own personal message. The wine is notable for its remarkable balance built on intensity and depth.